Congratulations going out to 2020 Matthew-Alexander Moncrieffe on selection to 2019 @nba Basketball Without Borders. A win over the defending OSBA Champs, coupled with another win in league play over A.I. 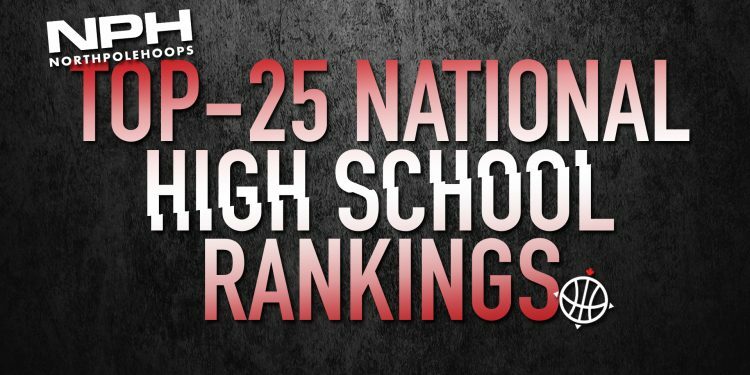 Red, has Orangeville Prep reclaiming the number one spot in the country. To top off this stellar week from the Bears, Matthew-Alexander Moncrieffe managed yet another personal honour, after being selected to the NBA Basketball Without Borders development camp coming up. The Bears will be back in action at the end of this month for the National Prep Invitational in Rhode Island, where they will be taking on Blair Academy out of New Jersey in their first matchup. CTA is off for exams, but will be returning to action February 2-3 in Rhode Island for the National Prep Invitational, where they will take on #7 nationally ranked New Hampton on Sunday according to Prep Circuit. FHC has continued to cement their top 5 status in week 12 with two solid league wins over Lincoln Prep and Southwest Academy. Joshua Morgan had a monster fourth quarter last night in London against Southwest, finishing with a season-high 41 points for the Crusaders. Meanwhile, Kobey Lam also finished with an impressive 37 in the win vs Lincoln Prep. FHC will now be off for Exams for the next week before taking on Vaughan on February 5th. An impressive win over number 3 Ridley College has Thornlea moving up a few spots back into the top 5. Keeshawn Barthelemy finished with 33 points in the W for the Thunder. They now sit 3rd in their division with four games remaining in their regular season. Thornlea still has a chance to get back into the top 3 if they have a strong showing at the National Prep Invitational out in Rhode Island at the end of the month. Crestwood managed to go 1-1 at the Flyin’ to the Hoop Showcase. Orginally not scheduled to take on Dohn Prep, they managed to not only show up on short notice, but knock off one of the top programs in Ohio. The Lions then made their way to Cincinnati for the First Inaugural Midwest King Classic, where they managed to knock off the host team Middletown Academy. A couple of high profile wins and a two possession loss in the one of America’s hottest current states for high school hoops is more than enough to move Crestwood up a few spots. Ridley College didn’t have a bad week, to be blunt a number of teams below them just had great showings, including Thornlea who managed to knock off the Tigers. All that said, Ridley is still a title threat in their league, and they are still more than capable of beating any team currently ranked above them on any given night if they play to their potential. Maintaining that potential, however, will be the Tiger’s biggest challenge as we creep closer to championship season. Rise Prep managed to take care of business against a scrappy A.I. Red squad in league action this week. They also however are casualties of teams below them having even more impressive wins this week. Kole Scott had 12 points to lead RISE in the win. RISE will now have a date with Ridley College in their next game that could have some huge factors in playoff seeding, while also getting the Wolfpack back into the top 5. A win against Lincoln Prep has snapped TRC Academy’s 3 game losing skid, with Sabry Philip leading the way with 23 points in the win. TRC now finds themselves in a dogfight for the top spot in their division, but that battle will have to wait until after the National Prep Invitational in Rhode Island. Vaughan managed to knock off a resurgent Central Tech in league play. Originally the Voyageurs were also scheduled to take on FHC this week, but that game was postponed due to inclement weather. That game has now been rescheduled for February 5th. Ryan Brooks has continued his dominance throughout the season with another 30+ point performance. Meanwhile Keeth Tennant also managed to leave an impression with the score sheet, knocking down four 3’s in the win over the Blues. Rothesay finished 1-2 at the Gotham Winter Classic out in Flushing, NY. Despite the two losses, Rothesay managed to knock off one of the top public school programs in the New York City area in Thurgood Marshall Academy, a feat no team from Atlantic Canada can claim in recent memory. Coach Damian Gay stated his approval of the team’s effort over the weekend, while lamenting how important this tournament was for getting Rothesay prepared for their next NPA matchup against CTA. A 1-1 week has Southwest holding steady at 11. Kobe Elvis continues to set the rim on fire, this time with 44 in a tough loss to FHC. Despite just being one game over .500 at this stage of the year, Southwest remains one of the most dangerous teams in the country, with a top level scorer and solid team energy to match any top program. King’s Christian is enjoying an extended break for exams, and will be back in action on February 10th. The Cavaliers are 1-3 in their last four, but given just how impressive this team can be at times, it is not that hard to imagine seeing them make a surprise run should they stay in contention for the postseason. TBA has the week off in preparation for the Chet Mason Invitational in Ohio, where they will be taking on Oakville Prep in an NPA exhibition game to showcase Canadian HS Basketball south of the border. Look for Marcus Masters and Amir Golizadeh to put on a show for those in attendance. Three weeks from today the first ever NPA West National Session will be hosted by @edgeschool in Calgary, Alberta! Kalyem Liburd-Mullings has continued a solid start to 2019 with 26 points despite a tough loss to Vaughan. The Blues are now 2-2 in league play since the beginning of 2019, and with three games remaining in regular season, Central Tech still has some time left to finish this season on a solid note. Okay Djamgouz might just be the top scorer of his class. Another 40+ point performance, this time around against D-3 Olivet College out of Michigan, in a very impressive 22 point victory, has LBA looking like a top ten program they were originally being projected to be this season. With impressive wins like this, and if the roster can stay healthy, now would be the time to watch out for one of the darkest of horses in the NPA. Pine Ridge continues their quest to OFSSA with another win over J. Clarke Richardson to improve to 6-0 in league play. The Pumas will be running the LOSSAA gauntlet with four games from now to February 7th. In that time, expect Pine Ridge to continue to prove why they are the odds on favourite to repeat as OFSSA champs. Despite a tough start to 2019, players such as Tyler Sagl and Bennett Grumbach are still managing to fill up the stat sheet. The Huskies will get a chance to turn things around and finish the season on a solid note as they take on Bill Crothers on February 1st. SBA has the week off after taking on some CCAA colleges last week. They still remain one of the biggest teams in the west and can match size with anyone across the country. For now they move down a spot until we get another chance to see them in action. LaSalle has continued to dominate the Eastern Ontario Public School scene with yet another tournament win. The Syllas brothers Cole and Luka also remain two of the best “Diamond in the Rough” prospects for any OUA or Northeastern JUCO that might be looking for two well-built forwards, that can make their presence known in the paint. GTA Hoop fans will get one last chance to see this up and coming program in action in Vaughan on February 8th and 9th. St. Benedict had another impressive showing in league play, with impressive shooting and transition finishes to go 10-1 in D8 play. With one game remaining in the regular season, they will be taking on a battle tested St. Mary’s HS on February 4th to try and secure the top seed and a bye in the first round of the playoffs. Look for the 1-2 punch of Ben Mascarenhas and Trent Johnson to show up in the score sheets for this Cambridge squad, as they attempt to claim yet another OFSSA berth in this school’s proud history of basketball. North Park finishes their regular season with a perfect 10-0 record after a win over Pauline Johnson. They will now get a first round bye before trying to claim the BCSSAA championship. Look for Judah Stewart to be the main scoring threat for North Park as they try to punch their ticket to an OFSSA berth.